President Katzav's office categorically denies any intention to sign an agreement to give over parts of Mt. Zion to the Catholic Church. President Katzav's office categorically denies any intention to sign an agreement to give over parts of Mt. Zion to the Catholic Church. Arutz-7 has received a copy of the alleged agreement to do so. "The State of Israel hands over to the Holy See the use of the Cenacle [the room of the event known as the Last Supper, above King David's tomb - ed. ], of the access path to it, and of the spaces adjacent to it... It is the Holy See's intention to inform the Bishops - and through them the world's Priests - that the Catholic Church has been given the use of the Cenacle, inviting them to visit the Holy Place together with their faithful... The Holy See hands over this use of the Cenacle to the Custody of the Holy Land [which acts on behalf of the Holy See]... [which] will keep the Cenacle open from 6 AM to 8 AM for the celebration of the Holy Mass... Official liturgical celebrations of non-Catholic Churches can take place only upon prior written permission by the Custody of the Holy Land." The proposed agreement stipulates that the Holy See will preserve the historic character of the site and keep it open to pilgrims and tourists, and that Israel will provide for the safety of the site. A Foreign Ministry official said, “Israel is not prepared to relinquish its jurisdiction over this area” - but he admitted that a blueprint of a possible agreement with the Vatican has been received. At present, since shortly after the Six-Day War in 1967, the Diaspora Yeshiva is located on Mt. Zion, and warns of the catastrophic implications for Israel if the deal goes through. "This is an enormous issue that is being pushed through without any public debate whatsoever," Yeshiva Director Rabbi Shabtai Herman told Tovia Singer on IsraelNationalRadio. He also spoke on INR's Stutz and Fleisher show. 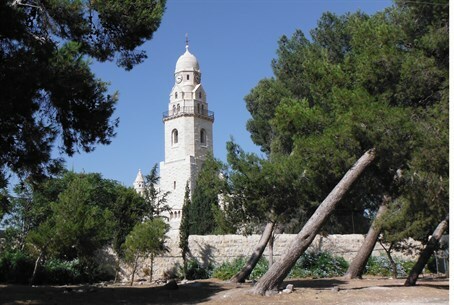 He explained that if the Catholic Church receives control of the area, just a few hundred yards from the Temple Mount and adjacent to the Old City walls, it will turn it into "the international center for Catholics all around the world, and if the pope just gives the word, Christians will be flocking over here en masse." In addition, he noted, "there are many different religions here, and we have respect for all of them, but giving control to the Catholics will cause terrible friction." "According to their bible, the land is to return to the Christians, and 144,000 Jews are to return to Mt. Zion. So their plan is for them to take control of the site, and then to announce that they are holding a mass reenactment of the Last Supper, with [all types of religious rituals], and to invite millions of Christians to come to Jerusalem and celebrate." He said that this means much tourism money for Israel, and that someone in the Israeli government is apparently very interested in making this happen. The King David's Tomb complex is a complex of buildings of some 100,000 square feet where David, Solomon and others kings of Judea are said to be buried. "It is certainly one of the holiest spots in the Land of Israel," Rabbi Herman said. "We've already given away the Temple Mount and the Machpelah Cave, except for here and there when we're allowed in; now they want to give Mt. Zion away as well? For thousands of years, this area was almost always totally closed off to Jews. G-d gave it back to us in 1948, but parts of it were still in range and sight of Jordanian snipers and were not in full use. After 1967, Rabbi Goldstein founded the Diaspora Yeshiva here - and it became an island of holiness, the first yeshiva for baalei teshuvah [newly religious] in Israel; we were there day and night learning Torah. Rabbi Goldstein was almost prophetic in establishing this yeshiva at that time at that spot; destiny from above intertwined him with Mt. Zion." President Katzav's office categorically denies any knowledge of plans to sign away the King David's complex, or intention to do so during his trip to the Vatican later this month. Despite this, Christian newspapers in Italy and around the world are replete with reports that such a deal is in the works. According to the reports, Israel will receive control of an 800-year-old synagogue in Toledo, Spain, known now as Santa Maria, in exchange for David's Tomb. International Society for Sephardic Progress, ridiculed this idea: "When the Jews of Toledo prayed each morning, they faced east towards Jerusalem. It was not Toledo that they desired, but the Land of Israel, which was still unobtainable. Now, we have Jerusalem, we can go to the holy sites and we can live in the land. If those who built that synagogue knew that this abandoned building in Christian Spain was being traded for a piece of real estate in the Land of Israel, they would roll over in their graves. Today, the Santa Maria Synagogue is nothing but an empty shell, a tourist stop in a city where no Jews remain." Rabbi Herman said that the above plan is merely the first step of a larger plan to turn all of Mt. Zion into a Christian site. He explained that the lower level of the complex, containing many chambers, rooms, passageways and the like, has long been under the control of Israeli bodies such as the Lands Authority, and that half of the area was assigned to the Diaspora Yeshiva. Rabbis Goldstein and Herman explained that over the years, the yeshiva has used the area for classrooms, housing, and other needs. However, they said, Jerusalem Chief Engineer Ari Sheetrit has made some "threatening" visits of late, together with other city officials. The rabbis said that Sheetrit has implied very strongly that the yeshiva is "not using the area efficiently," and that the city plans to take it over. Rabbi Herman said, "Our information, supported by many sources, is that this entire area is going to be given over to a tourism promotional company fronted by a man named David Bertoldi. Bertoldi has come with a supposed tourism project to take ownership of this area, close it off, and make it into a project that will serve Catholic tourists - and then anyone who wants to recite a chapter of Psalms will have to pay a $10 entrance fee, except for two hours in the morning. Bertoldi professes to be Jewish, but to the best of our information, he is a 'mumar,' someone who has transferred his faith elsewhere. He claims to be an independently wealthy man, but in fact is really just a straw man for -- the Pope! We have lots of information that he is in the pay of the local Francescan brothers, headed by Father Pierre Batista, and as far as we know they've already paid him $70,000, and he goes in to the various offices buying his way through the bureaucracy." Arutz-7 phoned the Jerusalem monastery that Batista headed until a year ago, and spoke with his replacement, who said that he knew Bertoldi, though "he is not a member of our congregation." Asked if Bertoldi works for the Francescans, he said, "That is hard to say." Rabbi Herman bemoaned the secrecy in which the entire affair and attempted buy-out is being shrouded: "Who knows if this isn't just the tip of the iceberg? Why is this not being brought up for public debate, among the Torah Sages, the Knesset, public opinion? Let it be put on hold until then! How can King David's Tomb itself, in the heart of Jerusalem, be passed along to the Pope, without even a whisper of discussion?!" MK Benny Elon (National Union), who served twice as Minister of Tourism, told Arutz-7's Hebrew newsmagazine, "This issue was raised several years ago. When I was Tourism Minister, I made it clear to a representative of the Pope that we would allow them to use one room with a side entrance that would not bother the yeshiva. But under no circumstances would we allow the transfer of ownership. But they said they want ownership, and that the Pope sees this place as the second-holiest, after the Church of the Holy Sepulcher. We have to be very strong and not give in to the Vatican on this." He said that at present, Christian groups come in and pray there, but the "sovereignty is ours." MK Elon said that the denial by President Katzav's office is "a major achievement, and was the result of public pressure. What has to be done now is to try to involve the Prime Minister, despite our troubled personal relations with him. He must intervene to ensure that the Vatican not gain control over such a significant site." Rabbis Goldstein and Herman sent a letter on this issue to Jerusalem Mayor Uri Lupoliansky. Arutz-7 asked the Jerusalem municipality for its reaction yesterday, but has still not received it.